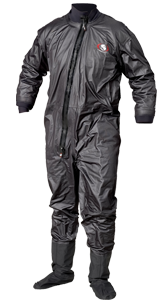 The Ursuit® MPS is suitable for all kinds of boating, fishing, paddling or outdoor activiities. Seam construction: double seams so that the seam will not open even when worn. Inside the seams are heat seal taped and reinforced to be 100 % watertight. New, extremely light double lock zip. Neck seal and wrist seals warm and waterproof 3mm neoprene. Weight under 1kg (size L).